With the 2018 U.S. Farm Bill on the horizon, ag policy experts and leaders are turning their attention to creating legislation that benefits agriculture as a whole. Although farm bills are created every five years, they use a 10-year baseline. For example, when the 2014 U.S. Farm Bill passed, it was projected to cost $956 billion over the decade. In January, the Congressional Budget Office estimated it will cost $80 billion less than projected, primarily as a result from lower-than-projected costs in the nutrition and crop insurance programs. Many say that as members of Congress consider a new farm bill, they should recognize the substantial savings already achieved. A full 77 percent of the current farm bill’s funding goes to those nutrition programs, leaving 23 percent for issues that directly affect ag programs. Crop insurance, accounting for about 8.5 percent of the farm bill and covering 90 percent of U.S. cropland, is especially crucial now. The Department of Agriculture estimates net farm income for 2016 was $54.8 billion, compared to $123.3 billion in 2013—a 46 percent reduction. Conservation programs—now about 6 percent of the farm bill budget—will also have to compete to maintain funding levels; disparate farm interests are joining that debate. “You see some unusual partnerships coming together, such as conservation interests and crop insurance interests, realizing it’s in all of our interest to work together to preserve these baselines,” Peterson says. Meanwhile, there’s concern about the new administration’s emphasis on budget cuts. “I see the need for the priorities this administration is talking about,” says John Larson, senior vice president of policy and programs at American Farmland Trust. “Fiscal responsibility is important, but not at the expense of our natural environment and the long-term ability for us to produce food, feed, fiber and fuel.” He hopes to see a balance of those needs. 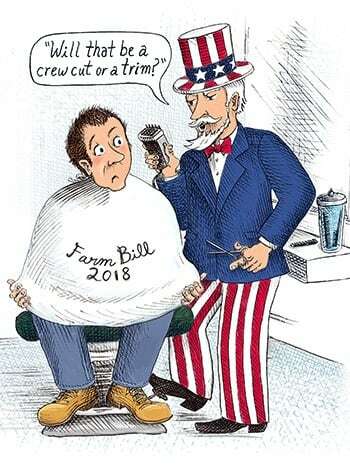 #Ag policy experts and leaders work to benefit #agriculture with the 2018 Farm Bill. Commodity program provisions make up about 6 percent of the farm bill; specialty crops and other programs are the last 1 percent. “Defending the societal investment in these programs remains a critical priority for our sector,” Peterson says.